It seems that this year’s Oscars have reduced the losers to double the tears – first, for not getting the coveted statuette; second for a “cheap” swag bag. The cheapest, in fact, in Oscar history – with goodies totalling “only” $45,000. Um, I think it would be satisfactory enough for me. Except for the fact that most of them are completely and outrageously bizarre – even by Hollywood’s standards. Let’s have a breakdown of the goodies and sees which ones are particularly covetable and which are totally missable. 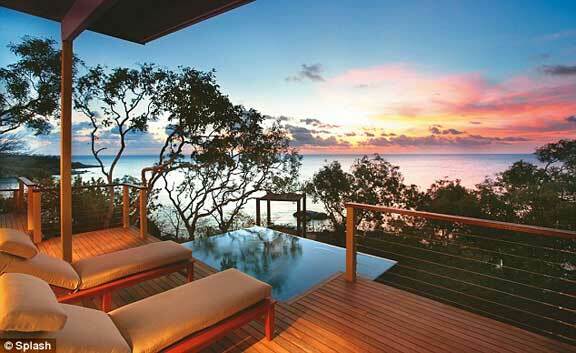 Ok, this one I can totally live with – an escape Down Under to one of two luxury resort vacations. First choice is Lizard Island, located atop the blissful Great Barrier Reef and named one of the top 10 beach resorts in the world by Forbes. Second option is El Questro Homestead, a private wilderness resort situated in the remote Australian outback. I will take the Homestead, thank you very much. Because one vacation isn’t enough to get over loser’s trauma, this year’s Oscar swag bag also features a five-night stay in a luxury villa – The Koloa Landing – on the island of Kauai in Hawaii. Every villa has its own gourmet kitchen, a master suite with a king-sized bed and floor-to-ceiling glass sliding doors. Plus, the 25-acre resort is surrounded by mountains, ancient sea caves, lagoons and some of the best beaches this side of the Aloha State. Done! Three nights in a deluxe oceanview suite at the AAA-Five-Diamond St. Regis Punta Mita, including daily breakfast, massages at Remède Spa, fine dining at Carolina restaurant. Yes, please. Now you wouldn’t want Steven Spielberg to be snubbed at the Oscars and have to stand in line for that trip to Australia along with the mere mortals, right? Enter London’s Heathrow Airport, which is magnanimously bestowing its private By Invitation VIP service – usually reserved for dignitaries and global diplomats – on the Academy Awards nominees. The perks? 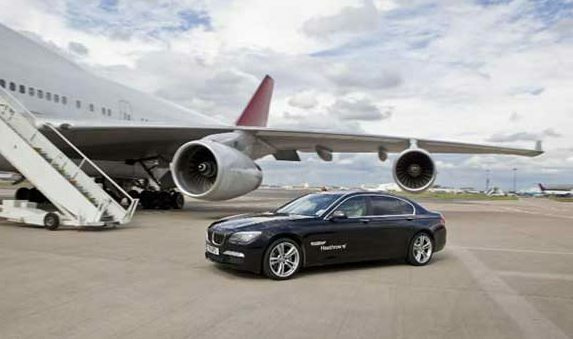 It allows travelers to bypass check-in processes, terminals, security checkpoints and be personally driven to the airplane in a luxury limousine. I accept. If you can’t be successful, you can at least be skinny – courtesy all-inclusive one week weight loss camp by Live In Fitness Enterprise at one of its two health resorts in Laguna Beach, California and Hilton Head, S.C. More resort, less camp, the package includes five-star meals, a spa retreat and cooking classes that have attracted actresses like Jessica Biel and Angela Bassett in the past. Oh! And there is also personal coaching and a seven-hour-a-day workout regimen. Interested? Anyone else thinks this is beginning to sound a bit like, “Get skinny and you might have a better chance next time”? This one includes The Essential Guide to the Dukan Diet, Dr. Pierre Dukan’s signature Goji berries, oat bran chocolate chip cookies, oat bran coconut almond bars and complimentary Dukan Diet coaching. Kate Middleton and Carol Middleton are supposed to be fans. Well! Wouldn’t hurt I guess. As long as I can also keep munching on my trusty After-Eights’ alongside. Ok, now this is really starting to err on the side of the ridiculous. A plate that allows you to portion control your meals is theoretically a good idea but I can’t really see this at Bradley Cooper’s dinner setting. Although it wouldn’t hurt me to actually try and have a balanced meal for a change. 8-15. Blah, blah blah & more blah! More “healthy” items include a package of 10 personal training sessions with Huntley Drive Fitness ($850), 5 private training sessions with Lalo Fuentes ($625), body slimmer from Cheetz ($69.95), gluten-free macarons from Macaron Magnifique ($60), Hydroxycut weight loss supplements ($50) and a year’s supply of youthH20, a caffeine-free beverage ($420). Oh! And there is also Diet Pepsi worth $250. Enough said. The chocolate brand’s Yellow Gold Diamond Collection has a “koji” sake-infused center encased in a 72% dark chocolate shell and adorned with a sugar diamond. 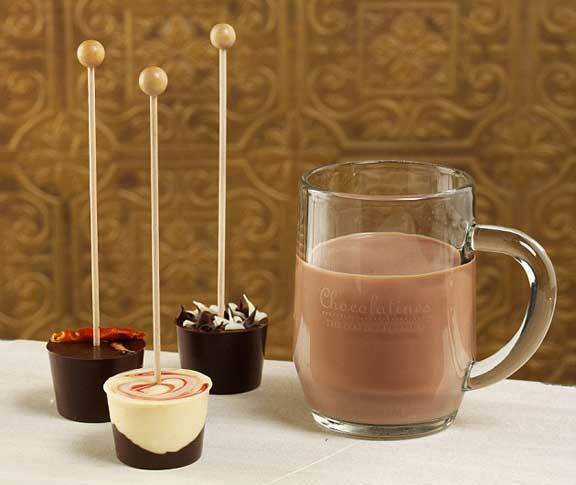 And there is a do-good element with the deliciousness – in an effort to support the recovery of 2011’s tsunami tragedy that struck Japan, Chocolatines use a premium sake made in a region that was impacted by the disaster. No, no and no! Nobody is sticking needles into my body, drawing blood and then injecting it into my face. No! Not even if this “nonsurgical facelift” promises to transform me into the next Bella Swan. NO! If Vampire Facelifts are not enticing enough, Oscar losers receive a $600 appointment for acupuncture or nutrition consulting from Santa Monica-based acupuncturist, herbalist, nutritionist and Reiki master Heather Lousbury. Her celebrity client roster includes Coldplay, Tori Spelling, Carmen Electra, Dave Navarro and Rainn Wilson. But the verdict’s still out on whether acupuncture can help treat the pain of an Oscar defeat. In 2010, Oscar nominees cats got a Tiffany crystal-studded collar and a FlipCam. This year, celebs received $29 Anti-Ageing Hand Sanitizers for their precious digits. Yup! The recession changes everything, baby. Have never heard of this brand before. Checked out their site and came back unimpressed. If I was Amy Adams, this one would be going straight to the bin charity. This one I don’t mind. Sedu tools were developed by top-scientists around the world to offer products that can withstand any styling challenge. Oscar Nominee gifts include Sedu Revolution 6000i Hair Dryer ($160), Sedu Icon Styling Iron ($250) and Sedu Revolution Clipless Curling Iron ($120). Me! Me! Me! I don’t know about Naomi Watts but a set of travel-size items from Lierac Paris (Sensorielle Multi-use oil, travel size Gommage body scrub, travel size Sensorielle multi-use oil mini and Crème Mesolift anti-aging radiance cream for $98) and Phyto (Phytovolume Actif Volumizer Spray, Phytolaque Soie Light Hold Hair Spray, Phyto Professional Intense Volume Mousse and Phytodefrisant Botanical Straightening Balm for $113) leave me cold. You? We’re not exactly sure what the nominees will be up to at the after parties, but at least they’ll be safe. Though at $5 a piece, you’ll need a million-dollar contract to afford these on the regular. After all that dieting and exercising, what could be better than showing off that hot bod in the D’Milikah 2013 Swimwear Collection – a Brazilian-inspired swimwear collection with a touch of Italian handcraft adorning each “unique” piece. Um, stars wear D’Milikah? Or would Badgley Mischka have been a tad more appropriate? Last year, celebs cats got a FlipCam with their face on it. Dog owners got a voucher for a professional dog photo studio. This year, celebs got a selection of Devicewear cases, including Ridge for iPad with Six Position Stand ($42.95), Ridge for iPad Mini with Six Position Stand ($39.95), Station drop protection case for iPad ($34.95), and Sketchy design-your-own iPhone 5 case ($19.95). I prefer my Kate Spade, thank you. I can just visualise this: Hugh Jackman distraught over not winning for Les Misérables but consoling himself with the endowment of an iPad keyboard that lets you feel where the keys are and rest your fingers on the home row without accidentally triggering the touch screen. Something is better than nothing, right? 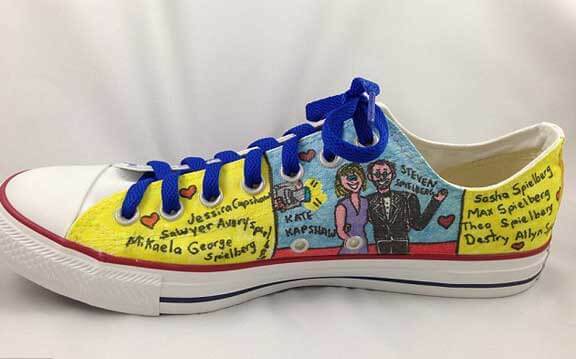 This new line of tennis shoes, hand-illustrated by Jeanette Longoria, would look quite smashingly cool with a ball gown. If only Kristen Stewart was nominated for something. Each nominee receives one pair of limited edition shoes ($350) plus a gift certificate for a one-of-a-kind customized pair ($500). Bonita Platinum Tequila ($99) – the world’s only five times distilled tequila and comes bottled in pure crystal. Born Free USA ($20) 100% organic cotton t-shirts. 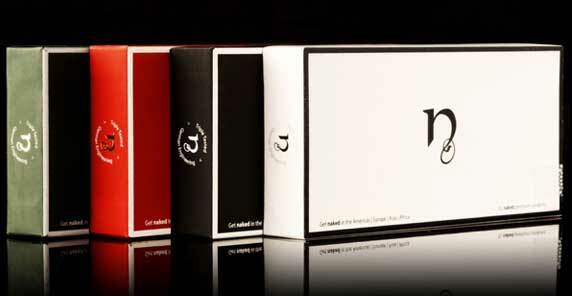 NJoy King ($40) – a premium electronic cigarette with the look, feel and flavor of the real thing, but without the tobacco smoke. Hickies ($19.99) – an elastic lacing system that allows you to turn any shoe into a slip-on. The Green Garment ($9.99) eco-friendly all-in-one laundry/duffel/garment bags. A Hollywood redesign that costs under $10k? If Denzel Washington’s Oscar loss inspires him to redecorate, Seyie Designs, a Los Angeles-based boutique firm helmed by Indian-born designer Seyie Putsure, who had her beginnings as a fashion executive with Dolce & Gabbana and Chanel, is offering her services. More recently Putsure was tapped to design the gifting suite at this year’s 2013 Grammy Awards, so we’re certain she has experience dealing with divas and runner-ups. What about you? What part of this swag bag would you like delivered to your home? And what could you live without? Do the nominees for the less-famous-categories get the same package? Like the best lighting nominees or whatever they have? Because I am sure, those people would at least be over the moon about this package. I mean, if you win something really, really cool in the real worlds, you get a 3000 Dollar vacation, not three of them. my thoughts precisely… I couldn’t figure out if they were being ridiculous for complaining about the stuff they got – like the vacations, which us mere mortals can only dream about – or it was ridiculous to give them stuff they would obviously never, ever use. Windex? Really?